I am happy about the Duke N.C. game, I was excited when they held on to the lead you don’t see that very often when a team plays Duke. Coach K thought that his kids played their butts off and that might be the case but they still lost. Let GO BLUE! N.C State wanted the game you could tell with the way they were playing and passing the ball. 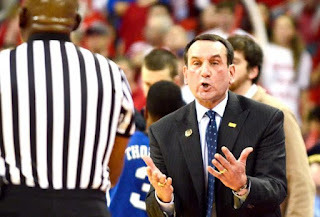 I am glad to see Duke lose maybe they will lose their #1 ranking too. I know that Duke had some injuries to deal with and some key players weren’t able to contribute but maybe now Michigan can be #1 wouldn’t that be nice. I gotta show love to my Wolverines and plus they are the only team left in the top 25 that is still undefeated and that has to make UofM fans happy.